Anne Porteous is leading her horses and us into a new way of facilitating personal empowerment and growth. Turns out, leading a horse to water may be a bigger coup than gettinghim to do anything once you arrive. Just ask Anne Porteous. A rider for most of her life, the Mohawk nursing professor has recently learned how significant it is to simply walk with an equine companion. In fact, it can be life-changing. Unlike other animals — say, a loyal pooch keen to please — horses only stay by one’s side because they choose to do so, and the effects of that can be a profound reminder of the value of clarity. “You’re able to lead a 1,000-pound animal. It’s a powerful message for a person: ‘When I’m clear, I can pretty much do anything,’” Porteous says. “It’s very powerful when a horse chooses to stay with you. It’s very dynamic, very powerful for someone who has been abandoned in life or has experienced isolation”. 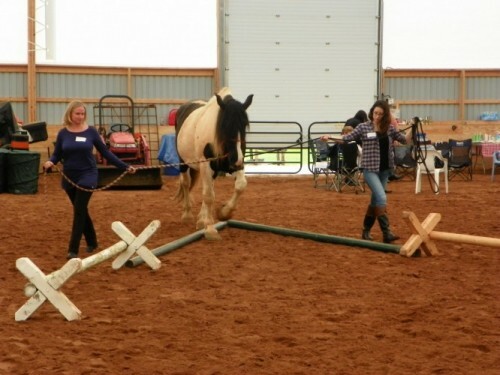 For the past year, Porteous has been exposing others to those positive effects through equine assisted learning and therapy programs offered at her Rockwood farm. She has seen communication, self-respect, boundary setting, empathy, problem solving, confidence and accountability flourish in the people who participate. Those changes haven’t gone unnoticed by her nearly 200 clients either, including corporate types, Mohawk faculty and those receiving psychotherapy. Most recently, it was a group of First Nations youth, from Mohawk’s Project Pathfinder, who benefited from spending time with horses. Porteous’s work stems from her own studies of natural horsemanship, an area of inquiry which she took up 10 years ago when she bought her farm and began working closely with her herd. Through that, she really learned about a creature she’d spent much of her life certain she already knew. Horses are intuitive and provide instant feedback to others, either by being relaxed and accepting of someone, or tense, uncertain and stressed. As prey animals, they’re sensitive to the feelings and intentions of people (the predator), and respond accordingly in the moment, sometimes doing what their human companion wants them to, sometimes not. They respond positively to clear, respectful, confident communication. They also mirror people’s inconsistent behaviours, ones their bipedal charges may or may not be aware of, and which may be holding them back in life. Now Porteous would like to take the anecdotal evidence she has gathered over the past years and turn it into something more formal. In Fall 2014 Porteous joined faculty from McMaster University to form Learning Beyond the Fence. This committee wants qualitative and quantitative data to demonstrate to others of the merits of equine assisted learning and therapy; and how it can complements other experiential education or healing that’s available. And there’s no reason why she can’t, particularly given her connection with Mohawk. Porteous hopes to pilot a program that would help high school students transitioning to college life and use the results to officially back up what she knows to be true. Once she gets ethics approval, Porteous plans to chronicle the effects of equines on her subjects during the program, then check in with them later to see if they are still applying what they learned in the sessions. Coping with transitional anxiety, non-verbal communication, leadership and teamwork are some of the directions she can take her work. “There are just so many avenues that we can take this,” Porteous says. “You have to be clear in your body language and mind when communicating with animals. In this time where everyone is texting, you can’t text a horse. You have to be very clear in what you want. Author Tiffany Mayer is a freelance writer based in Hamilton and Niagara.